We’re pounding the pavement for INJURY PREVENTION! Traumatic injuries are the #1 cause of death and disability for all persons age 1 – 44. Every year, tens of thousands of children, teens and young adults incur devastating brain and spinal cord injuries. Most injuries can be prevented by making safe choices – with driving, sports and other activities. You can help us teach kids how to “use your mind to protect your body” by joining Team ThinkFirst! Not a runner? You can still start a fundraising page (no minimum requirement), join us as a volunteer, or make a donation! Join Team ThinkFirst! by entering your interest and contact information below. DONORS and FUNDRAISERS will be redirected upon completion of form to http://www.active.com/donate/teamthinkfirst. 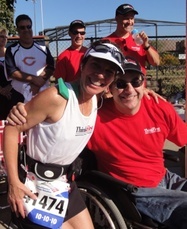 WHEELCHAIR RACERS, RUNNERS, and VOLUNTEERS will be contacted upon completion of form. Call us at 1-800-THINK56 or email thinkfirst@thinkfirst.org for more information. Questions? Contact the ThinkFirst Foundation at thinkfirst@thinkfirst.org or call: 630-961-1400. Thank you for supporting ThinkFirst! All proceeds go the ThinkFirst National Injury Prevention Foundation, a 501c3 non-profit organization devoted to educating children, teens and adults on reducing their risk for traumatic injuries.